Two titles remain untouched in this time of DC reboots, Batman and Green Lantern. Coming out of the new 52, Hal Jordan and the rest of the Green Lanterns pick up where the previous volume ended. Hal has been stripped of his ring, and Sinestro (Hal’s arch enemy) has been brought back into the Green Lantern Corps. This volume is similar to the movie Training Day in that Sinestro recruits Hal to help him tackle a looming threat. Two characters who hate each other are now working together to save the universe. Issue 11 is the beginning of a new story arc titled:Revenge of the Black Hand. The story begins as Sinestro is released from the custody of the Indigo Tribe (a version of the Green Lantern Corps that uses Compassion instead of Willpower). 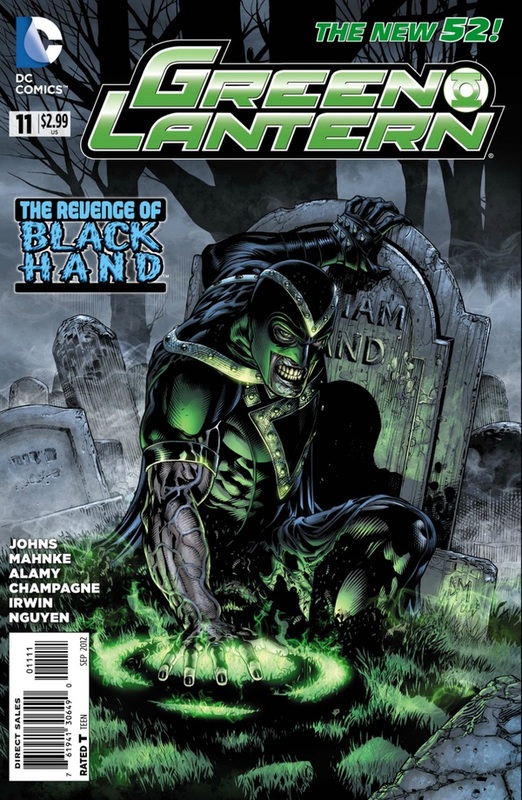 He and Hal go on the hunt for The Black Hand (the main villain from last summer’s DC event Blackest Night). In previous issues, the Indigo Tribe tried to convert Black Hand to their side. He escaped, killed himself and ultimately was given the Black Lantern ring, which makes zombies. Recognizing the threat Black Hand has become, Hal and Sinestro set out to stop him. While they are on the chase, Black Hand makes his way to a cemetery in a small town. 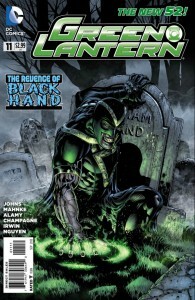 Using the power of the Black Lantern to raise the dead, Black Hand brings his family back as mindless zombies. In a very creepy scene, Black Hand sits around his childhood dinner table laying out his evil plan while his zombie family eats Chinese food. He is going to kill as many people as he can and bring them back as zombies so that he is no longer an outcast. Meanwhile, Hal and Sinestro go to what I would call Sinestro’s “Batcave”. Sinestro tells Hal that he has a way to find Black Hand – The Book of Black (the doorway of the tales of life and death). When the Green Lanterns open the book, they see a flash of what’s to come – a new Green Lantern, a close friend of Hal Jordan turning to the dark side, a former partner of Hal’s in a jail cell, and the Guardians (Heads of the Green Lantern Corps) turning on the Lanterns themselves. In a flash, both men are sucked into the book itself and are transported right into the dining room of the Black Hand who closes the issue with a simple line: “We Have Guests”. Geoff Johns is the reason this book is good. He brought Hal Jordan back as THE Green Lantern in 2004 (Green Lantern: Rebirth) and has written every issue of the main title since. It’s his dedication and love of the character that makes this one of the best runs in recent history and has kept this title on track. The title would lose something if someone else took over the writing. Johns has the ability to lay groundwork for future stories since he is the only writer on the book. That’s a rare thing in today’s market. The book also has some amazing artists behind its success. Everyone from Ethan Van Sciver (Rebirth), Carlos Pacheco, Ivan Reis, to current artist Doug Mahnke have contributed to the book. Mahnke has been on it since the relaunch, and his work has been incredible. He has a very rough style which gives all of the characters a unique look. He draws aliens and monsters better than anyone. It’s a perfect fit for everyone’s favorite space cop. This new story arc could raise Mahnke to another level. He’s going to get to draw zombies! I’m really excited to see Mahnke’s art progress. I love the main G.L. book. Simple as that. Forget the terribleness that was the live action movie. This book is one of the shining stars of the new 52. Go pick up the first trade. I really think you will enjoy it. It has heart, action, humor, and all around fun. What more could you want?